UNICO 20º87º Hotel Riviera Maya is a unique all-inclusive resort from the brand that brought you Hard Rock Hotels & Resorts. 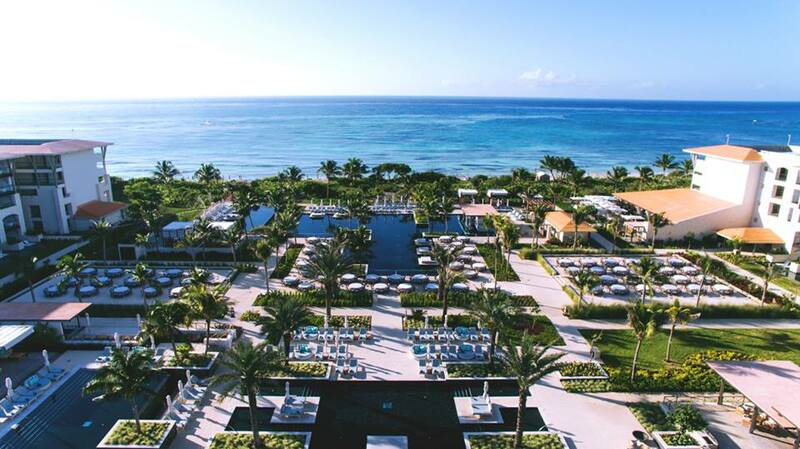 We love this resort and many of our agents have toured it and also had the privilege of staying here. We think that UNICO 20º87º is the perfect setting for a destination wedding. In fact, we are giving one lucky couple $3,000 towards their dream destination wedding at this amazing resort! If you and your fiance are interested in entering for a chance to win, RSVP for our 2019 Destination Wedding Seminar event. The event will take place Tuesday, February 12th from 5 PM to 7 PM at our office. That night, our entire staff of destination wedding experts will be present, as well as our amazing sales rep from Hard Rock Hotels, to answer any and all of your questions about destination weddings. Call us today at 402-390-9291 to reserve your spot and you will be automatically entered to win the $3,000 giveaway towards a destination wedding at UNICO 20º87º Hotel Riviera Maya. 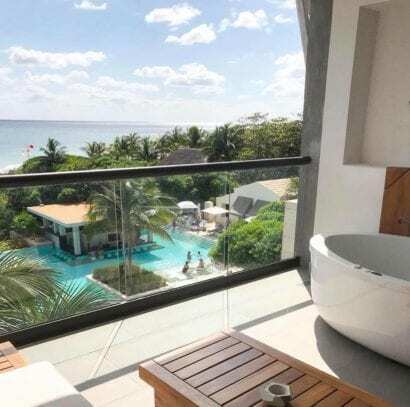 What we love about UNICO 20º87º Hotel Riviera Maya is that they truly embrace what makes Mexico so special. From the food and drinks, to the spa treatments and curated adventures, UNICO 20º87º sets a new standard for destination weddings. Even if you are not planning a destination wedding, UNICO 20º87º is a great adults-only option in the Riviera Maya. The 5-star, all-inclusive property offers an in-room mini bar stocked according to your unique preferences, custom-scented amenities, and four unique restaurants. In addition, UNICO 20º87º has 24-hour room service for all guests and three bars with an exquisite mixology program. Plus, you won’t have to leave your lounge chair or cabana with their poolside and beachside snack and beverage service, and you will never get bored with plenty of land and water sport options, and daily and nightly events. In addition to these standard amenities, you can enjoy even more for a small fee, like golf, scuba diving, spa treatments, beauty salon services, and offsite tours and adventures. Another thing we love about UNICO 20º87º Hotel Riviera Maya is their exceptional level of service at every corner. Even if you are venturing off the property, the staff will share their insider’s guide to the local scene. They will help you make reservations and share all of the best-kept secret spots in the area. A destination wedding at UNICO 20º87º is a unique experience that your guests will love! The dedicated team of wedding specialists at UNICO 20º87º make the planning process easy and enjoyable. Our destination wedding experts at Enchanted Travel work closely with them to ensure every detail is perfect. Everything from the decor, menus, entertainment, and every small detail in between will be taken care of. UNICO 20º87º offers three destination wedding packages to ensure your big day is unique to you and your fiance. The three packages are the Riviera Maya Experience, the One-of-a-Kind Experience, and the 20º87º Experience. 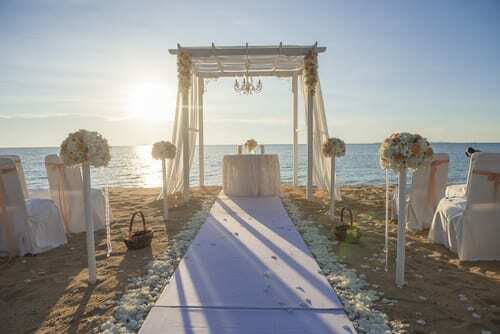 The Riviera Maya Experience includes ceremony decor and seating, bouquets and boutonnieres for the bride and groom, a non-denominational minister to perform a symbolic or vow renewal ceremony, audio system for the ceremony, a 2-tier wedding cake, and a sparkling wine toast after the ceremony. 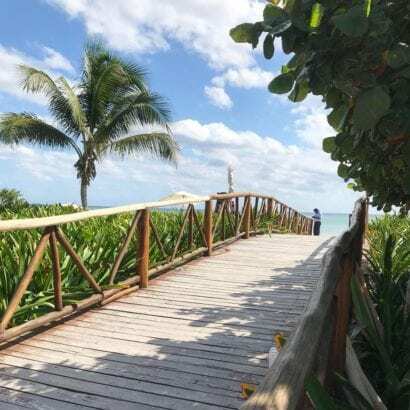 The One-of-a-Kind Experience includes everything listed above with the Riviera Maya Experience, plus additional aspects for more personalization. With this option, you can choose either a violin, guitar, or saxophone soloist for your ceremony. In addition, the package includes a “phone valet” for your guests to unplug during the ceremony. Unpacking services for the couple which includes all of the prep work for your wedding day attire is also included. In addition, this package offers a personal valet concierge for the bride or groom for the getting ready process on the day of the wedding, hair & makeup service for the bride, and a private dining experience for the couple. For the most personalized package, choose the 20º87º Experience. In addition to the perks listed above, you will receive a few more amenities to personalize your day. This includes printed menus and place cards for the wedding reception, personal valet concierge service for both the bride and the groom throughout the getting ready process, and a “getting ready” suite for wedding party. For more information, call our Mexico destination wedding specialists at 402-390-9291. You can also RSVP for our 2019 Destination Wedding Seminar on Tuesday, February 12th. Here you’ll get the chance to ask our UNICO 20º87º sales rep any questions you may have about their packages. In addition, you will be entered to win $3,000 towards a destination wedding at UNICO 20º87º Hotel Riviera Maya. Call us today to RSVP for our 2019 Destination Wedding Seminar. You can reach us at 402-390-9291.